Microsoft has retooled Skype, the messaging service synonymous with business users, for people living in emerging markets. Today, at its Future Decoded event in India, Microsoft took the wraps off Skype Lite. The service is an Android app that mains the core video and voice calling functionalities, but is optimized for those on limited internet connections such as 2G data. It is initially available in India, where it is localized in eight languages and has support for reading and replying to SMS and tracking mobile data usage. Microsoft has also built in a range of India-focused bots to help automate tasks and pull in content, such as news, in a more efficient way than opening a web browser. Likewise, to save on potential data usage, any photos, video or other files transmitted through conversations will be compressed. The app itself is a mere 13 MB to help conserve the limited space on low-end handsets that dominate emerging markets like India. The company said it plans to integrate Aadhaar, India’s national digital identity scheme, to enable certain services from June. That can “enable Skype users to verify the identity of unknown callers in a variety of situations where identification verification is required, including job interviews, goods and property sale,” Microsoft said in a blog post. Interestingly, Microsoft pointed out that Skype Lite was “built in India, for users in India,” demonstrating that the company is betting big on India’s mobile revolution. Internet access is tipped to grow faster in India than anywhere else on the planet, bringing about vast social and economic change, but it is very much in its early stages. Just 300 million of the country’s 1.25 billion population own a smartphone, according to figures from Counterpoint Research. Microsoft is far from alone in making an India push. Google has rolled out a range of services, including public Wi-Fi projects, offline support for a range of popular apps, and localization tweaks for its Allo and Duo messaging services. Despite these big names, Facebook remains in pole position in India — its WhatsApp service claims over 160 million users and its core social network is dominant for non-messaging purposes with 155 million users. 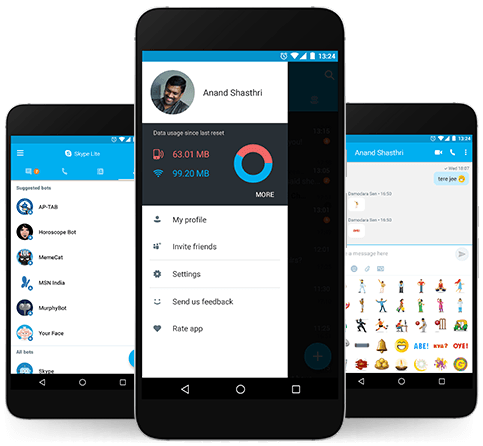 Skype Lite isn’t available at the time of writing, but it should come online today in India at this link. Microsoft didn’t provide guidance on when it will be available in other parts of the world.